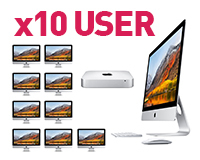 Our typical 10-user Apple iMac network is the perfect leasing solution for small to medium creative businesses. Microsoft Office for Mac 2016 or Office 365 can be added for all Macs as can printers and other peripherals. (We offer to lease storage solutions from Drobo, Sonnett and Lacie). Backup is resolved by a two-fold solution. Data is sent to the Seagate NAS in real time and a nightly back up of essential data is sent off-site. This data can be accessed remotely and the last fourteen days of data can be recovered. The Kerio Connect software is the Mac alternative to Microsoft Exchange and we also offer Sophos Anti-Virus protection. All leasing packages include everything to run your business with three years telephone /remote support by Apple Certified Technical Coordinators. For enhanced support our Gold option includes a Loan Mac should yours need to go away for repair. This five user Apple Mac Network utilises wireless connectivity but we do offer a CAT5 Cabling service that can be included in the lease costs. 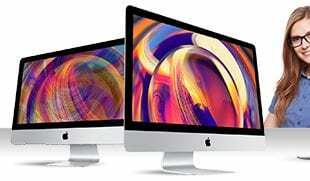 If you need a different Mac Network solution then contact one of our Apple Product Professionals for advice. 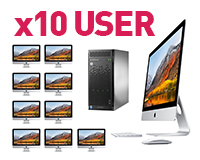 If you would like to find out more about the 10 user Apple lease or discuss further options, you can contact our helpful sales team on 0207 111 1643. Let us guide you through all of the payment options available to you. HardSoft has been trading for over 30 years. Our Apple leasing product is completely unique and the perfect solution for business. Apple leasing is 100% tax efficient and makes brilliant business sense. You can hold on to your cash and lease today. If you need to update your IT or expand, HardSoft can ensure that you are up and running in a matter of days. With the same great deals being offered to new and expanding companies, you do not need to worry if you have just started trading. 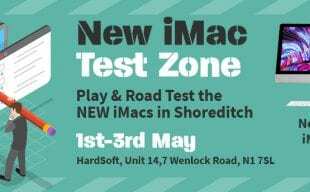 The HardSoft technical team are all Apple Certificated and are on hand to support your business with unlimited remote log in and telephone technical support. Utilising our help desk will save your company costly repairs and pricey support. HardSoft offer 3 years FREE warranty, this exceeds the Apple warranty offered by two years. If you have a faulty machine, we will collect, repair and return in a timely manner- all free of charge. With over 30 years experience HardSoft are not only an IT specialist but also a finance authority. As we are a one stop shop, you benefit from great prices and one point of contact. The Apple lease package is so flexible there are opportunities to change your lease after just 24 months, keeping you up to date with the latest technology on the market.